Copeland Borough Council is preparing to launch its new kerbside service that will see crews collect five items from households; plastic, paper, glass, tins/cans and cardboard. The service will start in April 2018, and residents can get a sneak preview of the type of new dedicated recycling vehicles the Council is going to use at two roadshows in Whitehaven and Egremont next month. Copeland Mayor, Mike Starkie, said: “This is an exciting development that we have been working towards for some time – recycling makes financial sense for us all and we have a responsibility to use resources efficiently and sustain the environment. The two information events will tell residents more about the new service. Copeland’s staff will be there to answer questions and demonstrate the new collection boxes and bags that will be issued to residents. 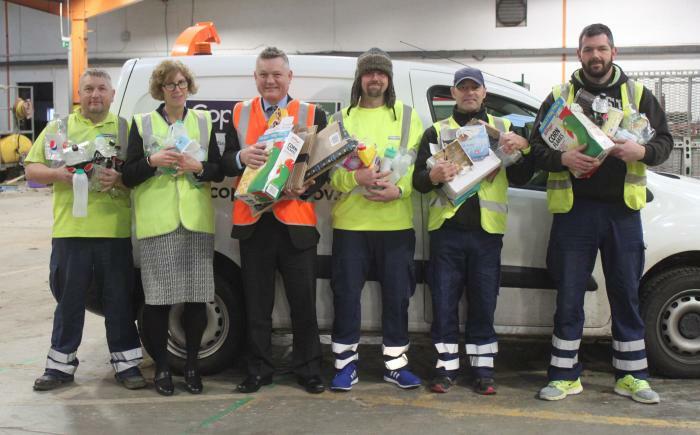 The council currently covers 95 per cent of the 33,600 homes in Copeland with its existing recycling collections, and it aims to increase that as far as is practicable with the new four-vehicle service. Crews will collect most plastics used in household items and not just bottles - tubs, pots and trays are included too – and the council will issue specific details of what materials can and can’t be collected nearer the time. A new waste crew (one driver and two operatives) will be recruited next year ahead of the roll-out. Mr Starkie added: “We continue to be challenged financially, therefore recycling collections must be efficient and where possible strive for commercial success. More details will be available about the new scheme over the coming months.